EarlyBird has introduced "shared folders". These are just like ordinary EarlyBird folders which can contain a combination of Twitter accounts, saved searches and "SmartTracks". The difference is that they can be accessed either by other members of your team or are available to all EarlyBird users anywhere. Shared folders provide an easy way to onboard new users. They enable a new user to start following appropriate sets of Twitter accounts quickly and easily. They also facilitate the sharing of relevant accounts and SmartTracks with other members of your team, so ensuring that everyone in the team sees the same news at the same time. 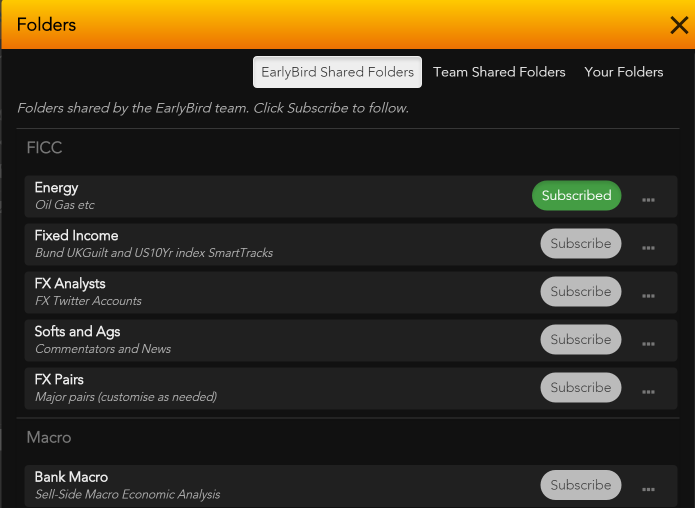 Shared folders appear in the folder list in the left hand navigation bar ("nav bar") of the EarlyBird dashboard and also in the EarlyBird mobile app. A shared folder is identified by an asterisk after the folder name. You can view the contents of folders you're following by selecting the folder in the nav bar - its contents are listed below the list of folders when it's selected. You can view the list of available folders by clicking the folder icon (below) in the top menu bar of the EarlyBird dashboard. This folder list also shows your folders in more detail than in the nav bar. There are two types of shared folders: EarlyBird shared folders which are owned, maintained and shared by EarlyBird, and which are visible to every EarlyBird user globally, and team shared folders which are owned and maintained by your team EarlyBird administrator. Team folders are visible only to members of your team - they're hidden from other people in your company that aren't in your team, and they're not visible to any external EarlyBird users. Your subscribed copy of a shared folder is unique to you, so you can remove accounts, searches and SmartTracks from it and you can add accounts, searches and SmartTracks to it. Your changes won't affect the original folder held by the owner. You can refresh the shared folder so it's the same as the current version of the owner's folder by right-clicking on the folder and selecting "Re-Sync from source"; - but beware, this will discard any changes you've made. Alternatively you can bring in any changes to the original folder while retaining your changes by selecting "Merge changes from source". 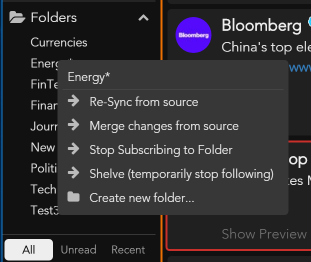 Of course you can stop subscribing to a shared folder at any time, but you can also temporarily suspend subscription to that shared folder by selecting "Shelve" - the folder will then be hidden and won't appear in the folder list in the nav bar. To unshelve it, click on the Folder icon in the top menu bar and select the "My Folders" tab. Scroll down and you'll see your shelved folders. Click on the "..." at the right hand side of a shelved folder and you'll see an option to unshelve it. When you select this option it will reappear in the folder list in the nav bar, and your Twitter timeline will again include the accounts, searches and SmartTracks contained in it. Currently the ability to share folders is restricted to EarlyBird ourselves and to your EarlyBird Team Administrator. We expect to enable sharing of folders by anyone, within their team, in the near future.